When I'm trying to join a new community by clinking on the "Join this community" button in the non joined community, I'm receiving the following confirm page. In that I'm seeing the description about the login account. There the icon for the Stack Exchange is displayed as Stack Overflow icon. 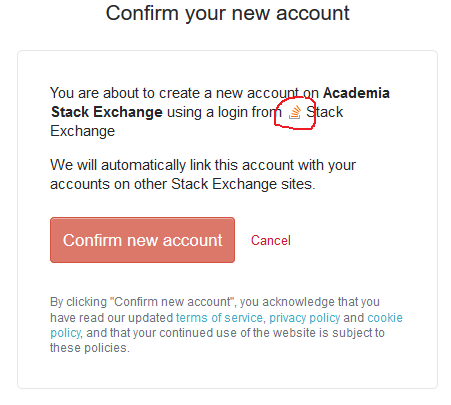 When I checked with My Logins in my edit user profile, the Stack Exchange account contains the Stack Exchange icon only. So it is a bug or the expected behaviour, or I'm overseeing that as an issue? Browse other questions tagged support login user-accounts .